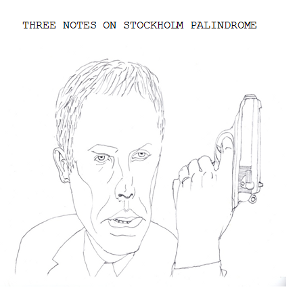 Grey park continues their excellent agent series with experimental and psychedelic notes on stockholm palindrome. No right! Released 26.10.2011. 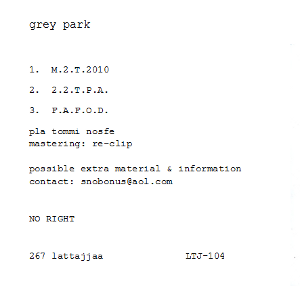 "Grey Park releases arrive like birthday cards with tenners in. Having said that Stockholm Palindrome doesn't surpass The Odyssey of Juri Gagarin [which came in an inverted coffee bean bag] or Planned Confusion [which was ... gasp, choke, a proper CD] it still manages to arrive covered in Finnish hoar frost though. These sparse deliveries from the Nordic climes are most welcome seeing as how I feel they convey the true spirit of the lone sonic adventurer - Yuri Gagarin was all Soviet radio broadcasts [in reverse], with star radiation pulse for company. Planned Confusion was lightly flecked experimental drone made with stuff kicking about on the floor. There was the odd single and cassette too but these two releases are the ones that are usually floating around here [mainly due to the fact that the coffee bag is so prominent]. Most GP releases have some kind of radio flicking going on in them, usually around the shortwave band, along with the feeling of having been stuck in a lonely house watching the snow come down. By treading a plank that wobbles between bedroom knob twiddler and art space pro Grey Park have managed to retain my interest over quite a number of years now.